Have you ever dreamed of designing your own engagement ring? Well, now you have the opportunity to be involved from the very beginning. 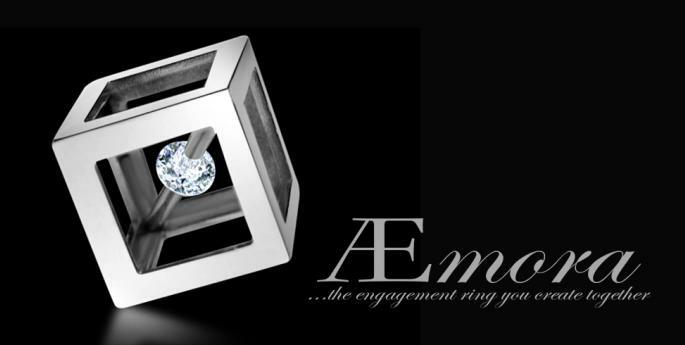 Æmora is a new concept in engagement rings. A diamond set in a platinum or gold cube, for you to present to your fiancée. We melt down your cube, hand make it into your design and set the diamond; transforming it into the engagement ring of her dreams. With a tour of the workshop, meetings with the goldsmith and photographs of the making of the ring, Æmora makes your engagement the most memorable, romantic experience. Designed just for you, by you. A one hour consultation to design your ring. A sketch of your design for your approval. Hand making your ring, using your certified diamond, along with the metal of your choice, a setting and the band shaped as desired. Photographs of the ring being made. The price for Æmora starts at £3,300. Your purchase includes the precious metal, a certified diamond, consultation with design and a workshop tour. We endeavour to complete within a 3 week period, dependent on the design, from the date of the initial appointment. Timings may over run during busy periods of which we will keep you informed. Make an appointment with one of our designers in the shop; choose a day, Monday to Saturday, 9.30am until 3.30pm. Look for inspiration and bring along any images or ideas to your consultation. Choose from our bespoke engagement ring single stone settings; Claw, Bezel, Crescent or Bar. Then choose your band, shaped as you like. Æmora is exculsively designed and made by Hallmark Jewellers. Additional charges apply if more metal, additional stones or settings are required other than the ones listed. What makes your diamond unique? Each Æmora diamond has been carefully selected to be of high quality and comes with the reassurane of a GIA certificate; guaranteeing its authenticity. Cut - The cut of a diamond determines its brilliance. Put simply, the better a diamond is cut, the more sparkle it will have. Carat - Carat is specifically a measure of a diamond’s weight and by itself may not accurately reflect a diamond’s size. Colour - A diamond’s colour grade actually refers to the lack of colour. In other words, diamonds that are white, containing little or no colour, receive higher quality grades than those with visible colour.